It is worth noting that Metro Atlanta has now experienced three consecutive winters with significant 3 inch+ snowfalls, you have to go back to 1892 to 1895 to find the same thing. According to Klause Wolter of the CDC: “The current rank of the MEI has dropped further from 16th last month to 13th this month, just a little weaker than moderate La Niña rankings. The 2010-11 portion of this La Niña event had been classified as strong (top 6 rankings since 1950) from July-August 2010 through March-April 2011, tied with 1975-76 for 2nd place in terms of strong duration, and only behind 1955-56 (15 months). ENSO is comprised of both El Nino and La Nina and La Nada or neutral phases. El Niño/Southern Oscillation (ENSO) is the most important coupled ocean-atmosphere phenomenon to cause global climate variability on interannual time scales. Here we attempt to monitor ENSO by basing the Multivariate ENSO Index (MEI) on the six main observed variables over the tropical Pacific. These six variables are: sea-level pressure (P), zonal (U) and meridional (V) components of the surface wind, sea surface temperature (S), surface air temperature (A), and total cloudiness fraction of the sky (C). A UK-based long range weather forecaster has issued a severe winter weather warning for 2011-2012. The advisory has been issued following one of the coldest winters experienced in Ireland and Britain more than 45 years. James Madden from weather organisation Exacta Weather correctly predicted the harsh conditions experienced over the last two years, and is once again forecasting record breaking snowfall and freezing temperatures during November, December and January. One of Madden’s primary methods of analysing long range weather conditions is his analysis of solar cycles. Last week Irish Weather Online carried a story from the National Solar Observatory (NSO) and the Air Force Research Laboratory (AFRL) stating that a missing jet stream, fading spots, and slower activity near the poles are signs that our Sun is heading for a rest period even as it is acting up for the first time in years. Dr. Frank Hill, associate director of the NSO’s Solar Synoptic Network, said of the results: “this could be the last solar maximum we’ll see for a few decades. That would affect everything from space exploration to Earth’s climate. The Pacific Northwest had a less-than-stellar winter in terms of skiing last year as seen in the Vancouver Olympics. 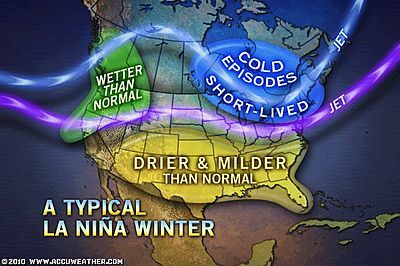 A La Nina weather pattern this year, however, could mean stormier weather for the 2010-2011 season. It can be difficult to forecast just how much more moisture a wetter-than-normal winter will bring, AccuWeather.com Expert Senior Meteorologist and West Coast resident Clark said. For the Pacific Northwest, though, Clark is predicting that precipitation will be "normal to well-above normal." He described above-normal precipitation as 20 percent or more that is typically received in the region. #Severe weather warning issued for northern Scotland as snow expected Sunday and Monday . #Snow also lay on the peaks of Snowdonia for the first time this winter. Winter's first snow flakes have fallen in the north of England and more of the white stuff is on its way this weekend say forecasters. As much of the country awoke to a crisp, frosty morning, in the South Tyne Valley snow quickly blanketed the ground and blizzards greeted those who ventured outdoors. Snow also lay on the peaks of Snowdonia today for the first time this winter. The Met Office has issued a severe weather warning for northern Scotland warning residents to brace themselves for snow on Sunday and Monday. Snow could also make an appearance across the Pennines. SOMERSET -— Apparently 'tis not the season for those who are fond of snowy weather. On Thursday AccuWeather released an updated winter outlook that backs off the idea that December will get the winter off to a snowy start. "That's out the window," Paul Pastelok, chief long-range forecaster, said in a written release. Snowfall this season is likely to be near to below normal in the mid-Atlantic region, with temperatures averaging above normal. Pastelok sees a season in which winter storms tend to cut toward the Great Lakes rather than blow up off the East Coast. That would keep the region on the warm side of storms. Meteorologist Meghan Evans said the worst snow and cold will be in the Midwest and interior Northwest. Chicago and Minneapolis will lie in the heart of this zone. CLICK to download PDF file and read FULL Public Sponsored UK & European Winter Forecast from Piers Corbyn. The UK media still ignore Piers Corbyn's long range weather forecasts at WeatherAction.com and instead use the "crystal ball" service from Jonathan Powell of Positive Weather Solutions, why! WeatherAction is the ONLY service that can produce long range forecasts with any accuracy, and it achieves this using the effect of predictable solar activity. To use any other service that relies on any other method just DOES NOT WORK as our climate is controlled by the SUN. Well done to Jonathan Powell for having a go but unless you use the service from Piers Corbyn your onto a loser in the long term. Britain is in for another bitterly-cold winter, with widespread snow and Siberian temperatures, according to a forecaster who claims to have accurately predicted last year's big freeze. Jonathan Powell of Positive Weather Solutions said the country should prepare itself for "back-to-back" harsh winters. Last winter was the coldest for 31 years, with the average UK-wide temperature from 1 December to 24 February being only 34.7F (1.5C), compared to the long-term average of 38.6F (3.7C). The mercury plunged as low as -8.1F (-22.3C) in Altnaharra, Scotland, while Benson, Oxon, recorded 10.8F (-11.8C). The Met Office had predicted there was only a one-in-seven chance of a cold winter, which was caused by strong anti-cyclonic activity bringing persistent icy winds off the continent, and keeping milder Atlantic breezes at bay.